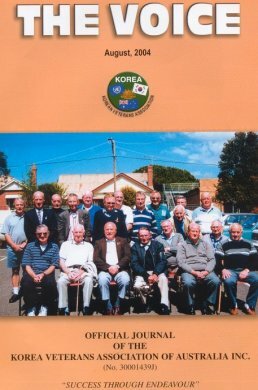 Korea Veterans Association of Australia Inc.
Patron: Major General J. C. Hughes, AO, DSO, MC. Australian troops participated in two major battles in 1951. On the evening of 22 April, Chinese forces attacked the Kapyong valley and forced South Korean and New Zealand troops into retreat; other UN troops, including Australians, were ordered to halt the attack. After a night of fierce fighting, during which their positions were overrun, the Australians recaptured their postions and stalled the Chinese advance, at a cost of only 32 men killed and 53 wounded. For their contribution to this action, 3 RAR was awarded a US Presidential Citation. From 1951 on, both sides found themselves engaged in a war of attrition reminiscent of the Western Front, where men lived in tunnels, redoubts and sandbagged forts behind barbed wire defences. The war was generally fought with artillery and mines and in set-piece battles; at night patrols ventured into no man's land to raid enemy positions. Between 1951 and the war's end, 3 RAR occupied trenches at the eastern extremity of the Commonwealth Division's position in hills north-east of the Imjin River. There they faced heavily fortified Chinese positions across a stretch of no man's land which ranged from 300 metres to 2 kilometres in width. After two years and 17 days of negotiations, even as heavy fighting continued at the front, the UN and North Korean leaderships signed an agreement on 27 July 1953. This agreement technically brought the war to an end, but a state of suspended hostilities continued to exist between North and South Korea for many years, and even today the situation remains unresolved. In the three years of fighting 1,263 men of the Commonwealth forces were killed and a further 4,817 were wounded, while the US lost 33,000 men. Australian casualties numbered more than 1,500, of whom 339 were killed. Almost half a million South Koreans died as a result of the war, and an unknown number of North Koreans and Chinese.